Hello! We are currently looking for more staff to help contribute and work hard to keep KH13 great! Nothing beats contributing to the success of something you enjoy and love! We are especially searching for people to contribute to the Social Media and News Teams. Joining the Staff has some wonderful perks, like working with fellow Kingdom Hearts enthusiasts who love giving back to the fandom with the latest news and updates, and being among the first to know any details we receive from said media outlets! For News Team: Passionate about the Kingdom Hearts series and up-to-date with the latest news. Active enough and availability to regularly watch out for news and *respond quickly* when something appears. Eagerness to volunteer, contribute, and engage in team work. Reasonable writing skills and appreciation for fact-checking and accuracy. Commitment and team dedication. For Social Media: A big interest in the Kingdom Hearts series. Active enough to regularly post on the KH13 Community Twitter, KH13 Tumblr & KH13 Facebook pages. Creativity Reasonable writing skills. Typical tasks: Posting KH13 fan-content (art, videos, discussions, fictions) daily Helping to create the Poll of the Day each day. Scheduling monthly posts: Kingdom Hearts anniversaries, Disney film/SE game anniversaries, birthdays, music (fan-made and original) & holiday posts. Looking for ‘other news’ to retweet on the Twitter page (t-shirts designs, music album/manga/novel releases, podcasts, etc). Coming up with ideas for new features or expanding on current ones. ﻿Graphic Artists needed! All candidates MUST: Have graphic design experience and/or education. You'll be required to make us a complete year's set of Images for event posts such as cast and crew birthdays and game release anniversaries. Be creative. All images must clearly and accurately reflect the event they're celebrating and be eye-catching. It's also important to take the initiative to give the art new and refreshing updates here and there. Have a flexible schedule to be able to both manage the images and work regularly with the team on daily tasks as the images will, for the most part, be a one-time job. Be knowledgeable. You must be familiar with the cast/crew of the games and the other events as it will be your job to update the cast/crew birthday list either to add new voice actors, remove inaccurate speculations or change an image from 'happy birthday' to 'in memory of' when someone passes away. Please apply below or message me in private here on the forums if you are interested!! Please specify why you want to join and let us know why we should pick you Look forward to hearing from you! I thought I already made one of these but I can't find it. OH WELL HERE'S SOME STUFF I DID All of these aside from the last one were done in Colors 3D, if you were curious. SuperGroupies have officially released new illustrations by Tetsuya Nomura of Kairi, Riku, Roxas, and Lea! 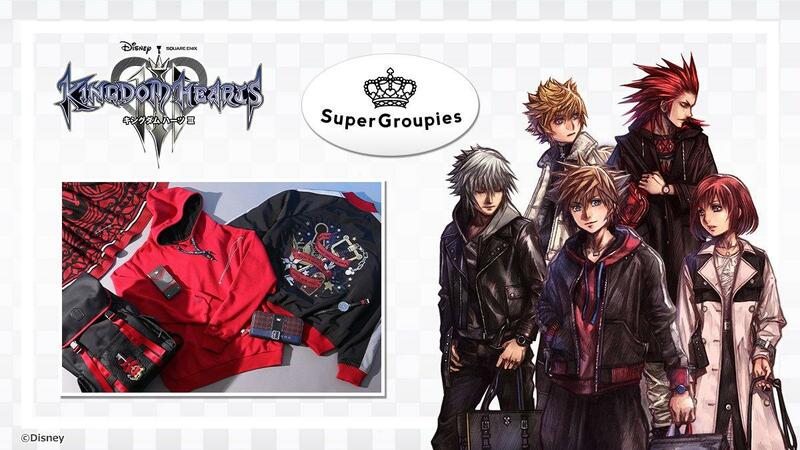 The illustrations are similar to Sora's SuperGroupies illustration and features Kairi, Riku, Roxas, and Lea wearing the SuperGroupies x Kingdom Hearts clothing line. For customers who pre-ordered any Kingdom Hearts SuperGroupies item will be given a mini-poster of one of the character illustrations. UPDATE [Nov 30, 2018] Pre-orders are now available! You can pre-order until 11:59:59 PM JST on December 16th. You can pre-order by clicking here . Please note that all items are made to order and will be available for shipment during certain times. Delivery Estimates: February 2019: smartphone cases, scarf & pin set, necklaces April 2019: bag, wallets, outer wear, tops, and skirts May 2019: watches The illustrations can be seen in the galleries down below! UPDATE [Dec 2, 2018]: The SuperGroupies event, showcasing the Kingdom Hearts line at their pop-up store, has started! You can find more information about the campaign in our previous article and on their website. Check out some of the fan pictures from the event below! I just commissioned a new avatar from the artist PaulDraws. He makes some absolutely amazing stuff and I adore his art style! The outfit is inspired by Sora's KH2 outfit with a more blue-ish tone to it. The zipper has Roxas's pendant on it and I also have a cute little Stitch plushie hanging on my shoulder. And of course I'm holding the Kingdom Key to make it as Kingdom Hearts as possible. I also had him draw a Christmas version that I'll be using once we get closer to the holidays! Don't mind me, I was bored and wanted to share it with you guys. Feel free to share your thoughts! 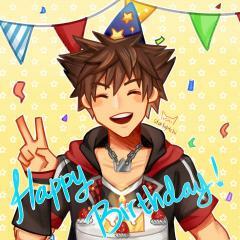 What's your favorite Nomura artwork of the past year? 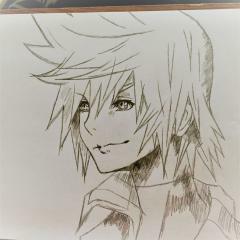 My first attempt at drawing in Tetsuya Nomura's style. ^^ Character: Ventus. Hey guys...I haven't made a thread here in a LOOOOONG time. But because I was drawing recently, I decided I wanted to share some art with you guys! I'll be pulling these up from my deviantart page, so sorry for the watermark. *clears throat* So um, first, Before and After, where I took the same drawing and redid it around, maybe, two years later to see how I've improved. Before: After: Before: After: Next up some Kingdom Hearts related drawings! This one's a RP character I based off Sora This one is from another RP character of a Kingdom Hearts RP, where I made his station of Awakening These two are keyblades I created (I should do the others but I've been too lazy to scan them). The first one is based off a bullet And this one is based off Final Fantasy VII:Crisis Core Then there's this comic about the dragonborn when I played Skyrim Then this mother nature drawing So yeah! Those are the ones worth mentioning, I just wanted to share them with you guys. I hope you like them. These are human versions of the mobs found in both Kingdom Hearts 1 and 2. 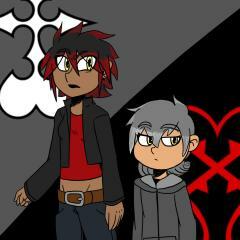 Their names are Shadow and Dusk after their respective base mobs. This is the first post I've made on this side of this site. I hope you all enjoy it. Wooden Keyblades, Drawings and... stuff. Maybe even a FanFiction? Hey guys! I decided to share my work with you. To cut things short, I like to draw... but it happens only once in a few months. So I don't have much material of drawings right now. But the ''good'' thing is that I failed my exam on monday So I have now enough time to draw, write or work on KH related stuff For the beginning... have a look at my wooden Starlight Keyblade! I made this on a whim last summer. Took a big plate of wood and painted a Keyblade on it. So it isn't real balanced, the grip for example. But for my first time working with that kind of stuff I did real good. You can watch the progress on the pictures below. (Nevermind the trainstation plan in the background... haha) You can even see the transitions for sticking together, I used wood mastic(or how its called) to hide them. It is quite heavy, around 2,5kg/5.51lbs - I can lift it with one hand... but swinging around takes both. This is one of my characters from my planned KH Story ''Point -255''. 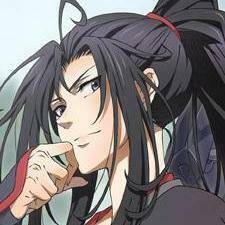 He is called Master Iustus and uses light and darkness as well. Like a scale, he thinks it must be in balance to exist - There is no ''pure'' evil. It depends on the person who does it. Currently under revise, got some new ideas for him. If someone could help me to translate it into English? I would appreciate that! Another picture of Iustus. 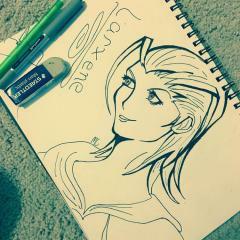 I tried a more realistic style like from JoJo's bizarre Adventure. But it always merges with such a comical structure... and I am never satisfied with that. What I like is his outfit changing more and more. 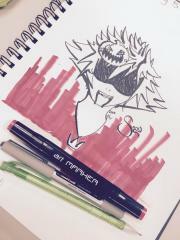 The first sketch of him was a catastrophe! But still funny how he evolved. Never meant to play a bigger role in my story, so is he now quite important against the villain (a dark version of my KHx Avatar but not just copy/paste) Feedback and stuff welcome! My contest entry for the contest! 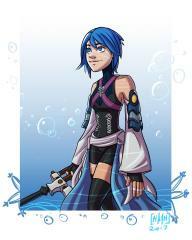 Ah...I love Aqua.... Made in Photoshop & Paint Tool Sai Click here if you want to see it on my Deviantart! 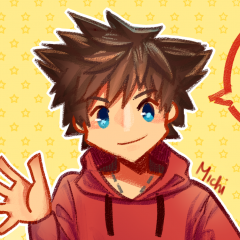 Kingdom Hearts themed art commissions! A while back, we found out that Zordon's trusty robot assistant Alpha 5 will be in the movie and will also be voiced by Bill Hader. Now, after getting confirmation of Alpha 5 will sound like, we have confirmation of what Alpha 5 will look like. This design is obviously a big contrast to how he looks in the original show, but that's to be expected. One thing to take way is that he still keeps the original color scheme of gold/grey/red. Personally, I believe Alpha 5 probably won't play a big part in the movie as he is only meant to be Zordon's assistant and nothing more, so the design is nothing really for me to take away from other than, well, it exists. I do however appreciate how it keeps in line with the new "futuristic/symbiotic" theme that seems to be taking hold of the whole PR aesthetic in the film. He's purple. And he has a purple festive rifle. He'll rock any class' world. And I drew him. Thoughts? This was my inktober drawing for day one!